dDAAM expression in the embryonic CNS. A, RNA in situ hybridization of dDAAM reveals a strong expression in the developing embryonic CNS from stage11 onwards. B–D, The anti-dDAAM staining (in red) shows a ladder-like pattern in a wild-type ventral nerve cord, corresponding to the major axonal tracts, where the protein displays a strong colocalization with that of actin (green). E–G, Wild-type cultured embryonic neurons. dDAAM (in red) is enriched along the axonal shaft, and also in the growth cone filopodia (visualized with actin staining in green), often at their tips (arrows). The central growth cone region is labeled with β-tubulin (blue). H, The dDAAM cDNA encodes a protein that contains several conserved homology domains including GBD, DID, dimerization domain (DD), coiled-coil region (CC), formin homology domain 1 (FH1), FH2, and DAD. The position of the dDAAMEx1 and dDAAMEx68 alleles, and the structure of the C-DAAM and DADm-DAAM isoforms, are indicated below the cDNA. Scale bars, 50 μm. Axonal morphogenesis defects in dDAAM mutant embryos. A, In a wild-type embryonic ventral nerve cord, BP102 stains the complete neuropile which forms a ladder-like structure composed of the longitudinal connectives and two commissures per segment, whereas anti-FasII stains a characteristic subset of the longitudinal fascicles in the connectives (C, D). dDAAMEx68 zygotic null mutant embryos display mild CNS morphology defects including thinning of the connectives (arrows in B) and gaps in the lateral most FasII positive tracts (arrowheads in E). F–H, The three classes of CNS morphology defects exhibited in dDAAMmat/zyg maternal and zygotic mutant embryos are shown on these panels. Class I, weak; class II, moderate; class III, strong phenotypic category. I, Quantification of the penetrance of the CNS phenotypes in different dDAAM loss-of-function allelic combinations and the rescue of dDAAMmat/zyg with UAS-FLDAAM and UAS-EGFP::mDaam1. n = the number of CNSs examined. Scale bars, 50 μm. 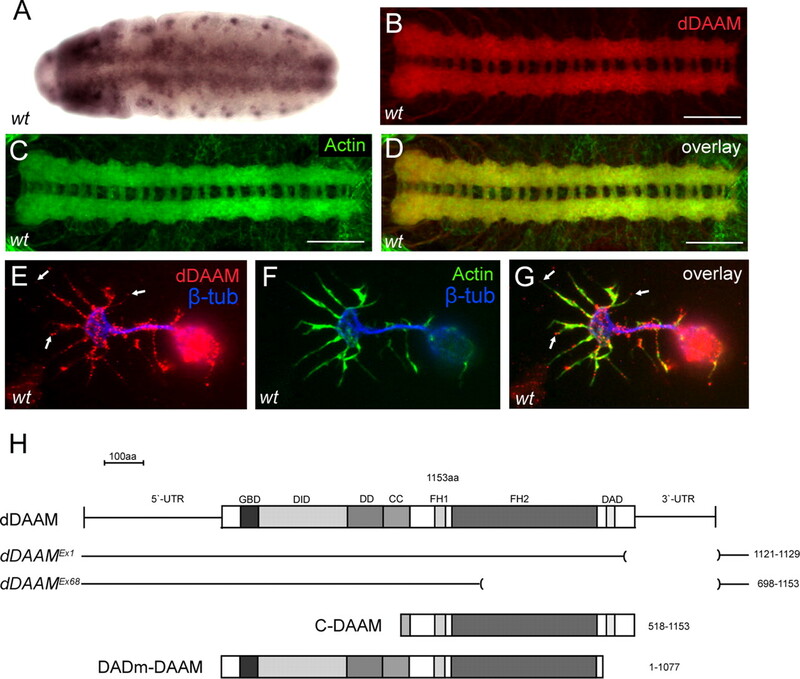 dDAAM is required for filopodia formation in cultured embryonic neurons. A–I, Primary neuronal cultures obtained from wild-type, dDAAMmat/zyg or Sca-Gal4; UAS-DADm-Daam::EGFP embryos, visualized with actin (white in A–C, I; blue in G), anti-Ena (red in D, white in F), anti-Daam (green in D, white in E), anti-HRP (blue in D) or anti-GFP (green in G, white in H). Compared with wild-type (A), dDAAMmat/zyg mutant neurons (B) display fewer number of and shorter filopodia, whereas their number is increased in Sca-Gal4; UAS-DADm-Daam::EGFP neurons (C). D–F, Endogenous dDAAM localizes along the axon shaft, but also along filopodia, often at their tips (arrows), where it tends to colocalize with Ena. G–I, DADm-Daam::EGFP displays a similar localization pattern as the wild-type protein. J–O, When DADm-Daam::EGFP (green in J and M, white in K and N) is expressed in S2 cells, it induces the formation of long axon-like protrusions. The protein is enriched in the protrusions, particularly, in their tip complex (arrows in J and K), where it is often colocalized with Ena (arrows in M–O; red in M, white in O). 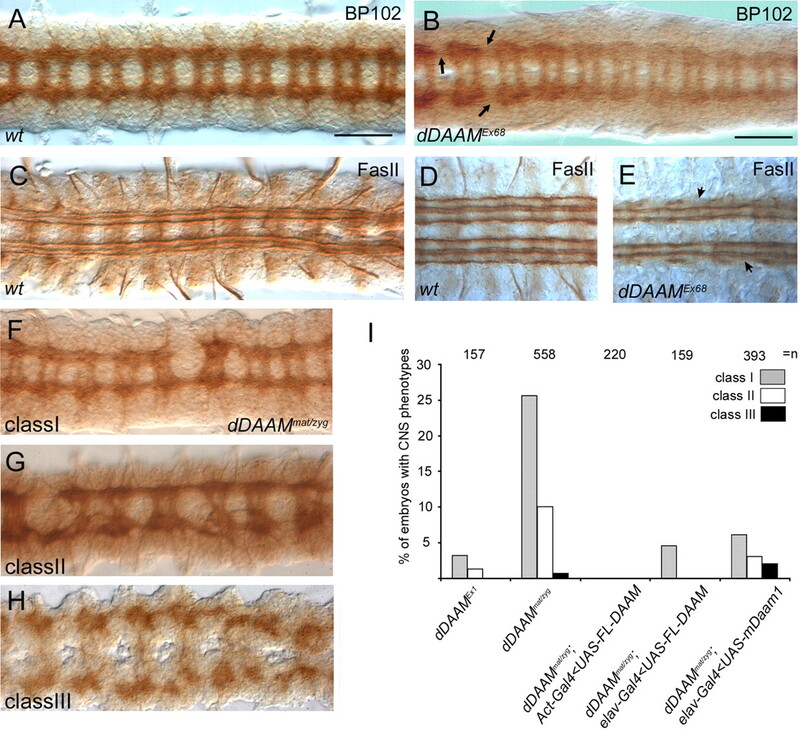 P, Statistical evaluation of the axon and filopodia phenotypes exhibited in wild-type, Sca-Gal4;UAS-DADm-DAAM, dDAAMmat/zyg and dDAAMEx68 cultured neurons. Bars represent mean values with respective SEs in percent, normalized to wild-type controls; numbers above bars represent sample numbers; p values on top were calculated via Mann–Whitney Rank Sum Tests. The color code of the genotypes is indicated in the boxed legend. All cultures were grown for 6 h after plating, only dDAAMEx68 neurons were dispersed after 3 d in preculture and grown for another 6 h to deplete maternal component. Scale bars, 5 μm. 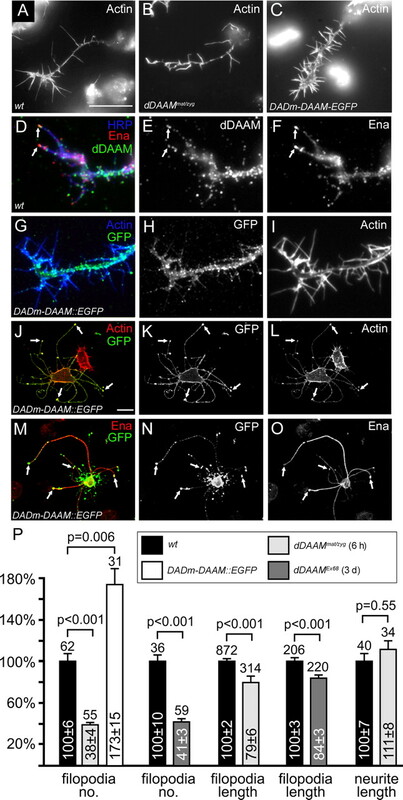 Activated dDAAM impairs axon growth and guidance. Compared with a wild-type dissected nerve cord (A, E), C-DAAM overexpression in the CNS impairs axonal morphogenesis. 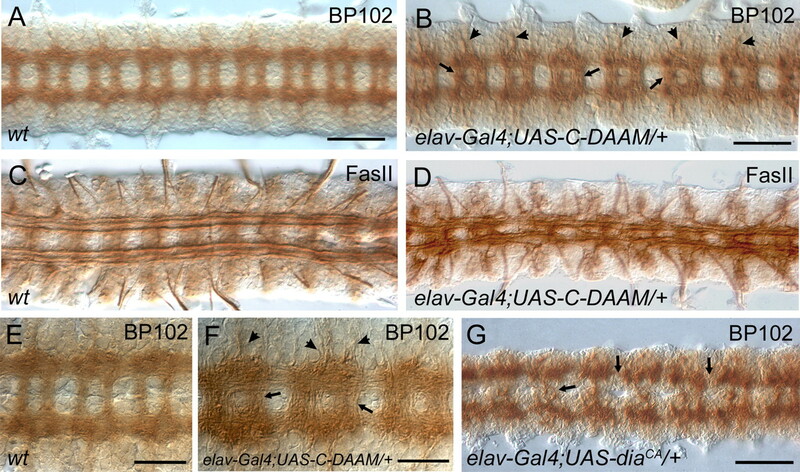 Nerve cords from an elav-Gal4; UAS-C-DAAM/+ embryo (B, F) display more compact axonal tracts than wild-type (compare A and B, and E and F), thicker commissural tracts (arrows in B and F) and increased number of axons exiting the CNS (arrowheads in B and F). Visualization of the FasII positive axons in wild-type (C) and in elav-Gal4; UAS-C-DAAM/+ (D) embryos revealed that activated dDAAM impairs the organization of these longitudinal tracts, the occurrence of tract fusions, midline crossing and increased number of axons exiting the CNS into lateral direction, are evident (D). G, The CNS specific overexpression of diaCA mainly induces breaks in the longitudinal and commissural axon bundles (arrows). Scale bars, (A, B and G) 50 μm; (E, F) 25 μm. 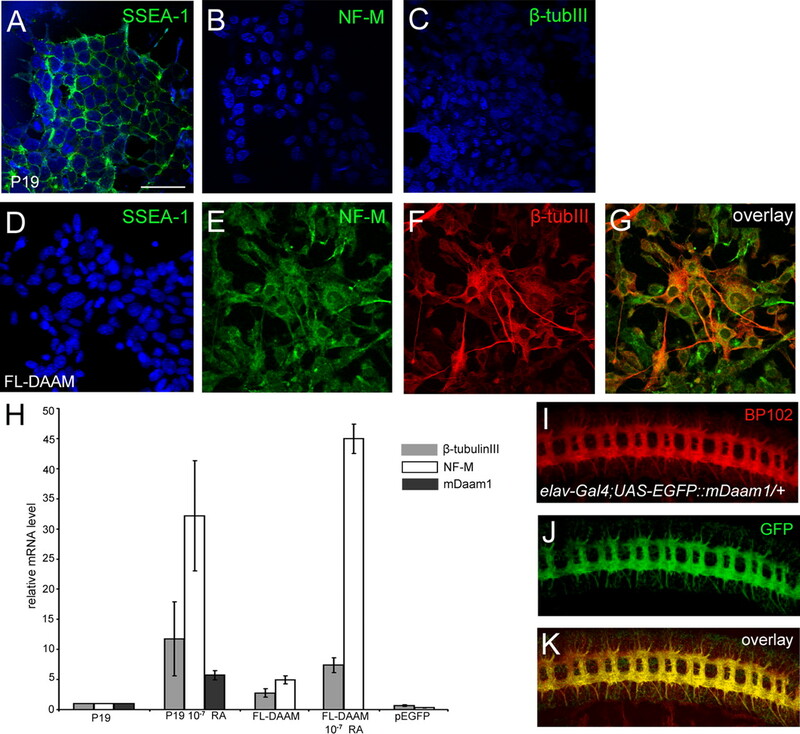 Activated dDAAM promotes neurite outgrowth in nerve cord cultures. A, Regenerating motor axons (labeled with anti-FasII) are visible in a moderate density from a wild-type nerve cord grown on a poly-l-lysine coated glass sheet. 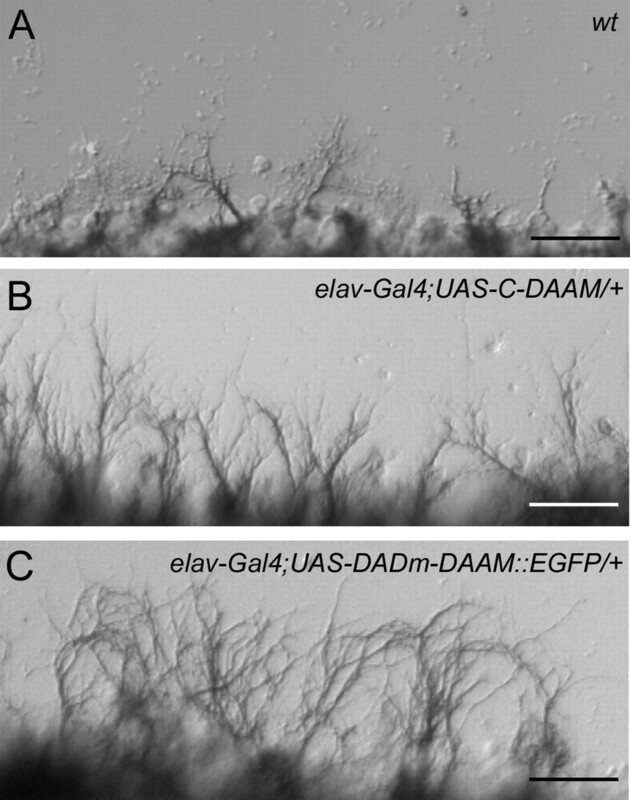 B, C, Axon growth from elav-Gal4; UAS-C-DAAM/+ or elav-Gal4; UAS-DADm-DAAM::EGFP/+ embryos leads to the formation of increased number of axons with increased length, which is particularly evident in case of elav-Gal4; UAS-DADm-DAAM::EGFP. Scale bars, 25 μm. Genetic and biochemical interaction studies with dDAAM. A, Quantification of the axonal growth defects (breakages in the neuropile) in embryos that are homozygous for dDAAMEx68 in the presence of one mutant copy of RhoA, Rac (Rac1, Rac2, Mtl), chic or ena. The number breakages was counted in every nerve cord, the severity of the phenotype was classified as weak, moderate or strong. B, Quantification of the axonal growth defects (breakages in the neuropile) in embryos that are homozygous for the mutations shown in A or homozygous for the same mutations in a dDAAMEx68/+ genetic background. C, Quantification of the CNS defects (the appearance of thicker commissures and nerve roots) exhibited in elav-Gal4; UAS-C-DAAM/+ embryos in the presence of one mutant copy of the genes shown in A. A–C, n indicates the number of CNS examined. D, Immunoprecipitation (IP) of lysates from S2 cells transfected with DADm-DAAM::EGFP using anti-chic and probed with anti-dDAAM (left lanes). IP with anti-ena, probed with anti-dDAAM (right lanes) and anti-chic (middle lanes). 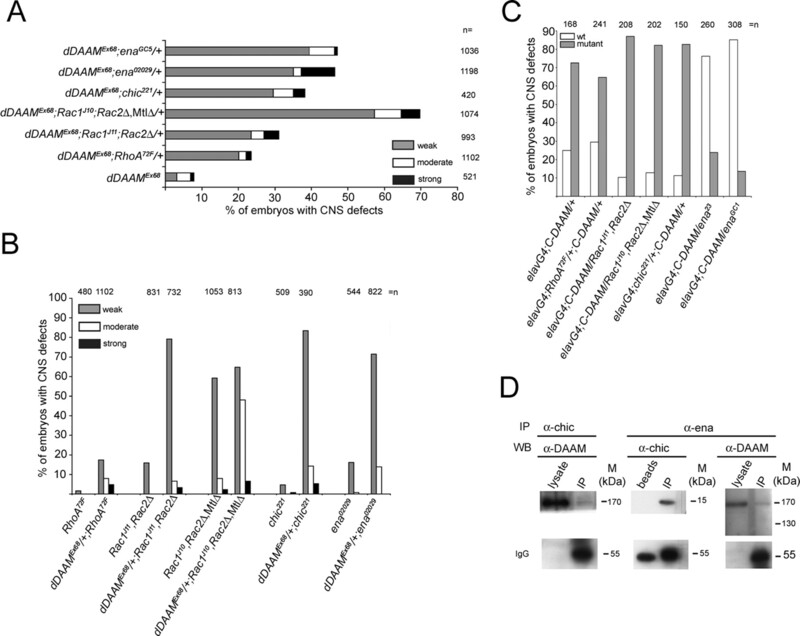 Chic coimmunoprecipitates DADm-DAAM::EGFP, whereas Ena coimmunoprecipitates DADm-DAAM::EGFP and Chic. dDAAM expression in P19 cells, and mDaam1 expression in the Drosophila embryonic CNS. A–C, Undifferentiated P19 cells express the SSEA-1 (green in A) marker but not NF-M (green in B) or β-tubIII (green in C). D–G, Most cells expressing Drosophila FL-DAAM lose the expression of SSEA-1, while a subset of them expresses NF-M (green in E and G) and/or β-tubIII (red in F and G). Note that some of the NF-M and/or β-tubIII positive cells extend long, axon-like protrusions. Nuclei in A–D are labeled with DAPI (blue). H, Quantification of NF-M, β-tubIII and mDaam1 relative mRNA levels in control P19 cells, P19 cells treated with 10−7 M RA, cells expressing Drosophila FL-DAAM, cells expressing Drosophila FL-DAAM treated with RA, and cells transfected with an EGFP expressing vector. I–K, The expression pattern of a UAS-EGFP::mDaam1 (green in J and K) transgene is shown in the embryonic CNS, note the strong colocalization with that of BP102 (red in I and K) along the major axonal tracts. Scale bar, 50 μm.